One of the key determinants of equity price momentum higher over the last few years has been the buyback spending spree corporations embarked on while interest rates trended near record lows. Companies that were not eager to invest in productivity, research and development, or capital expenditures to grow the top and bottom line, enthusiastically exploited low borrowing rates to buyback company shares, adding to the upside in prices. However, with earning season approaching, publicly traded corporations are subject to a blackout period where they are unable to buy back shares for the five weeks preceding an earnings announcement and the 48-hours subsequent to the release. With these flows eliminated, the stage is set for another round of tumult in Nasdaq 100 futures. The Nasdaq 100, in many ways echoing the S&P 500 and Dow Jones Industrial Average, saw a great benefit to valuations during the quantitative easing years and balance sheet expansion as evidenced by the sheer amount of appreciation from the 2009 lows over the last 6 years. However, with interest rates on the rise and earnings season around the corner, the creeping buyback blackout threatens to undo recent gains in the index following the rebound from February’s losses. With companies unable to repurchase shares and both institutional and sophisticated investors net sellers over the last two months, finding a buyer of last resort will prove challenging for component companies as earnings announcements rapidly approach. Due to the highly accommodative policies of past years, c-suite executives were able to deliver value to investors merely by financing the repurchase shares, pushing prices higher by reducing the total supply of shares outstanding. Instead of focusing on growing revenues during a challenging economic climate, companies opted to pad the bottom line with cost cutting measures and improve earnings per share by shrinking the number of publicly tradeable shares. However, the executive backslapping is about to experience a stark reversal as borrowing costs rise. According to recent comments from key voting members of the Federal Open Market Committee, markets should be cued up for another 25 basis point rate hike from the Federal Reserve as soon as the April meeting. Alongside the blackout period and higher interest rates preventing the same pace of buybacks witnessed in recent years, the potential for Federal Reserve balance sheet shrinkage and strengthening dollar also pose risks for equity investors. With stocks being the preferred path of least resistance over the last few years, valuations have oftentimes pushed well beyond rational levels. 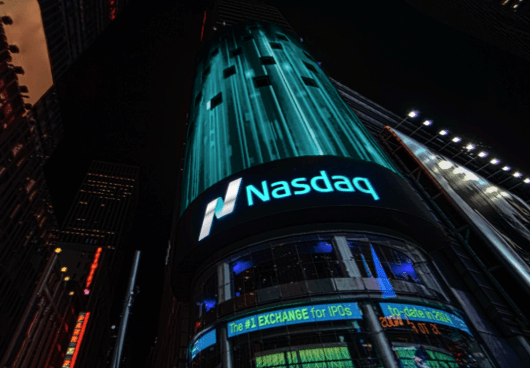 The price-to-earnings ratio of the Nasdaq 100 stood at 21.45 as of last Friday, highlighting the overvalued nature of constituents which traditionally exhibit ratios between two-thirds and three-quarters of current levels. Although a better value than the S&P 500 and having a higher weighting high growth technology companies, this still leaves ample room for a correction to current valuation. With the dollar pushing higher and the balance sheet likely to be pared back in coming years, flows to stocks will likely reverse course, putting immense pressure on Nasdaq futures over the medium and long-term. A stronger dollar makes Nasdaq components more expensive to peers on a relative basis, diminishing upside potentially while a central bank balance sheet contraction alongside higher rates will likely lead to a massive reallocation of investment capital. With these risk factors in mind, the stage is set for a renewed period of correction lower in the Nasdaq 100. With corporate buyers of last resort prevented from propping up valuations and investors heading for the exits, there are few silver linings for the equity benchmark. Since the outset of 2016, Nasdaq 100 performance has been under pressure. The index opened the year to a massive rout, plunging nearly -17.00% before rebounding in the middle of February. Since bottoming out, Nasdaq 100 futures have recovered by 580 points, marking a 67% retracement. While a move above a 70% retracement might be enough to instill a sense that the recent bullishness is set to continue, current levels mark an optimal point to start reconsidering positions to take advantage of what could be a weak earnings season with limited buying thanks to continued outflows from institutional investors. 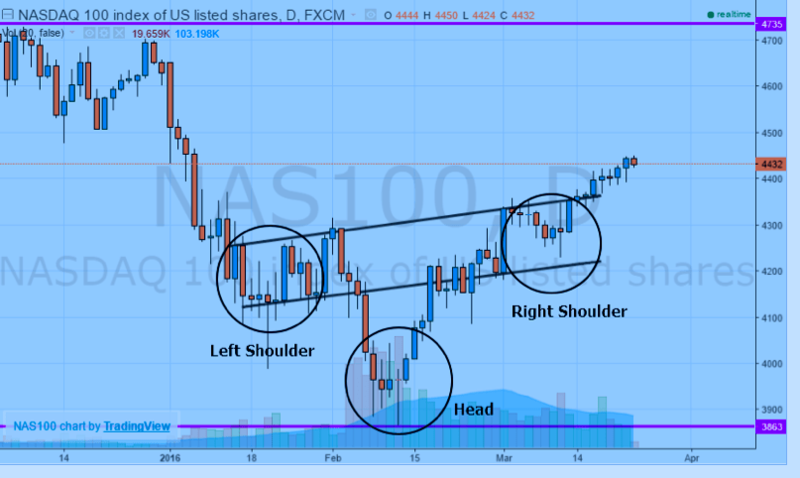 The head and shoulders bullish pattern that emerged after the February rebound has an upside bias, but the breakout appears to have run its course, preparing for a reversal and resumption of the downtrend. 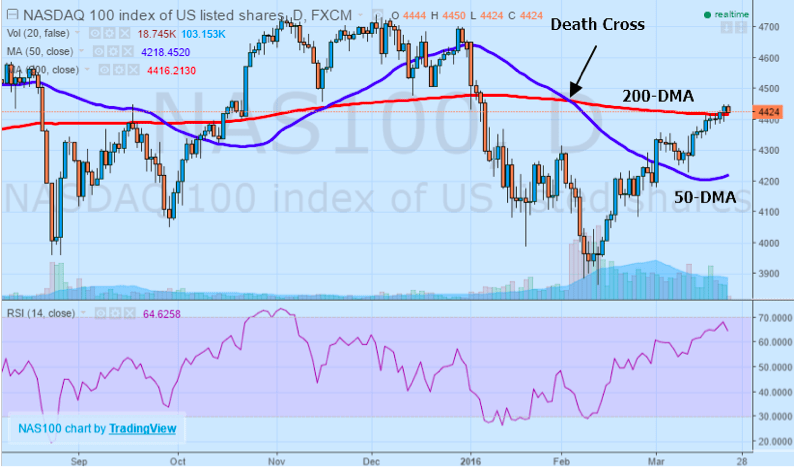 Even though the index is trading above both the 50-day and 200-day moving averages that are acting as support, the 50-day moving average crossing below the 200-day moving average in February could be an ominous sign, traditionally indicative of the “death cross.” Adding to the bearish case is the relative strength index rapidly approaching the 70 level, a strong signal that the index is overbought and potentially overvalued on a technical basis. Should today’s daily candlestick stay within a very narrow range, it could suggest the emergence of a “doji” candlestick reversal pattern if confirmed by an additional bearish candlestick in tomorrow’s trading session. With these indicators showing the Nasdaq 100 futures with a slightly stretched valuation, positions anticipating further upside could be taking a big risk considering the vaster downside potential. With share buybacks about to be put on hiatus and a number of external concerns potentially taking the air of Nasdaq 100 component valuations, the futures contract has substantially more risks to the downside than upside capacity at present. 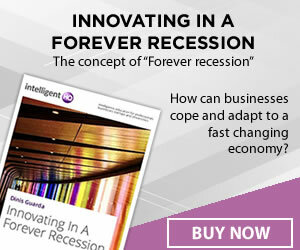 The ongoing shift in monetary policy combined with the possibility of softer revenue and earnings growth could be additional factors that weigh on the index over the coming weeks as investors begin the process of reallocating capital to other asset classes. Bearing in mind these factors, the blackout period might prove the catalyst for another serious downward correction in the Nasdaq 100 futures contract.